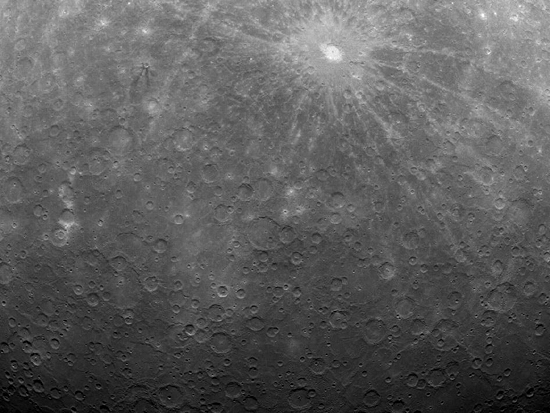 First Images of Mercury Taken From Orbit « Adafruit Industries – Makers, hackers, artists, designers and engineers! The spacecraft then took 363 more photographs before sending the images to Earth; more will be released to the public on Wednesday, when NASA will hold a news conference about what it sees on Mercury. The Messenger began its trip through the inner solar system six and a half years ago, and it entered orbit around Mercury on March 18. Since then, engineers have been checking out the spacecraft before turning on the instruments, including the camera. During the mission, expected to last at least a year, the Messenger is to take 75,000 more photographs, allowing scientists to map out the planet’s entire surface and study its geology and atmosphere in detail. You can check out streaming audio from the press conference today at 2pm. I’m kinda disappointed it’s only audio, though — maybe we need to send Mosfet down there to help them set up a webcasting suite. I can’t be the only one curious about the brains & comms setup for this spacecraft (& Cassini et al), right? Anyone found any detailed information on the comms hardware or coding scheme, other than the fact they’re using “circularly polarized X-band phased-array antennas”?